A Word doc, for example (the origin of her PDF poems), a file type with a fairly rudimentary and utilitarian purpose, becomes for Dale a playful space in which the poem can extend itself beyond its limits. The format — an electronic file of white rectangular frames/pages with a basic sans serif font and a wonderfully gnarly-looking illustration rendered in MS Paint or similar — gives us a thing that wants to decimate our concept of the poem, of even the illustrated poem. It is drenched in early-2000s aesthetic, web 1.0 or maybe web 0.5. It appears again a couple of pages later, distorted. 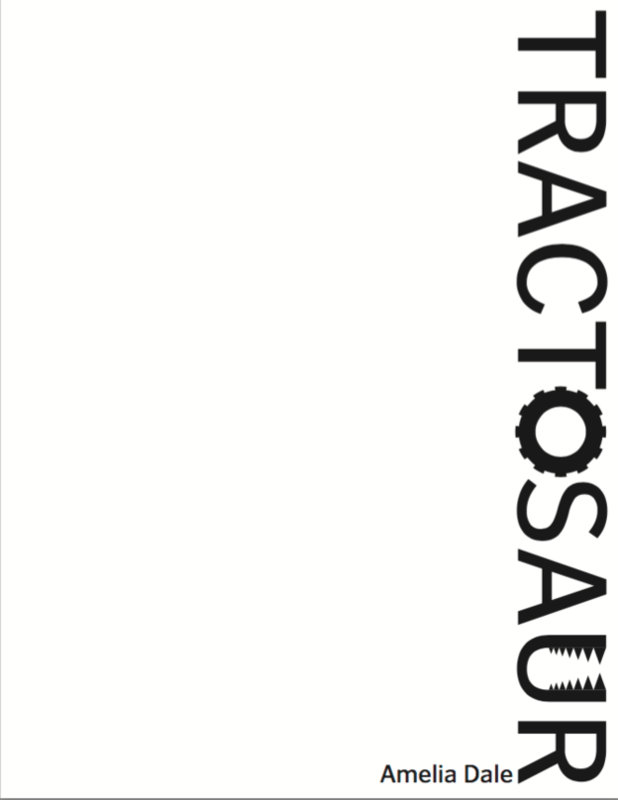 The narrative, meanwhile, is increasingly replacing words with ‘tractosaur,’ devolving to noise and ultimately transitioning to the word ‘tractosaur’ over and over again, organised on the page in an almost-neat fashion, with spacing just inconsistent enough to mimic something a child might have formatted. This is part of Dale’s genius. This poem, in fact, is one very good example of how she plays with form so well — how she refuses content any room in a poem whatsoever. The distortions of the image continue, each time with a new fuckery: angled, or changed in texture or even multiplied on a small scale, like the word tractosaur itself. The tractosaur says ‘ROAR’ in one speech bubble. This is a poem about inanity. It is a poem about entertainment, storytelling, and its ultimate success is how it magages to be none of these things while being about them. I love returning to this poem whenever I’m feeling down about my own writing, whenever I need poetry to slap me in the face and tell me to stop being a whingy, uncreative fool. It’s fun to unpack this, but only because it is such a strong example of how visual poetry or ‘illo poems’ can have another layer added to them in the Internet sense. TRACTOSAUR is a poem but it’s also a package and also it is a treasure. It invites you along for the ride and at no point demands any great thing from you in order to reap its rewards. I am thinking about poems and images, about why a book of poetry might include images (illos, collages, plates, jpegs from ms paint, oils), or how a book of poetry might comprise mainly images, how what looks like a large and floppy comic is really also a book-length poem. Why poems need images [an attempt to sketch a history of this]—how William Blake illustrated his own poetry, how a couple of Petrarch ekphrastic sonnets outlasted the artwork they described, or, how I have a compulsion of my own to accompany my poems with a glitched image or photograph of a nearby texture. This compulsion is what has led me to seek out the histories and examples, past and current, of poems that work with, through or around images, and to record a collection of various poems I’ve examined. I hope the result of this is a primer or vague sampling, of contemporary poetry pics. While many of these will inevitably draw upon Melbourne poets, I don't plan to restrict the geographical scope of this project. elena gomez is a poet and book editor based in Melbourne, Australia. She is the author of a number of chapbooks, including A GLAZED WINDOW W/FAT BORDERS//[TAUT & DISCOLOURED] (Stale Objects dePress) and her poems have been published in Cordite, Mascara Literary Review and Scum Mag. She is completing an MFA at UNSW Art&Design.